The beautiful trees with the peeling bark are members of the Ericaceae, the Blueberry Family of plants. In fact, though not widely used, the berries are edible, even good. Why not go out and get some today? Well, the problem is that these are the high, high, highbush blueberries. The berries are often more than twenty feet above the ground, potentially as far as sixty feet up. How do we get these, then? Wait for a windy day. Stay inside. The day after the windy day, go for a walk among the madrones with a bag and no sense of urgency. The berries, often in entire clusters, often litter the forest floor. There are few lookalikes, so make certain you know what you have gathered. 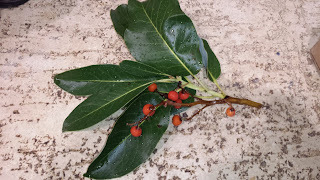 Ilex plants are not native to California, but the Holly bushes are often planted as landscape and occasionally pop up even in undisturbed forest, and have red poisonous berries. Less problematic is the Toyon, a native member of the Rose family - nicknamed the Christmas Berry, which is just not as tasty. The berries have nubbly surfaces, sort of like the surface of a basketball - these are not smooth berries. The Madrone tree has evergreen leaves with smooth edges, and smooth reddish bark on younger branches and trunks. 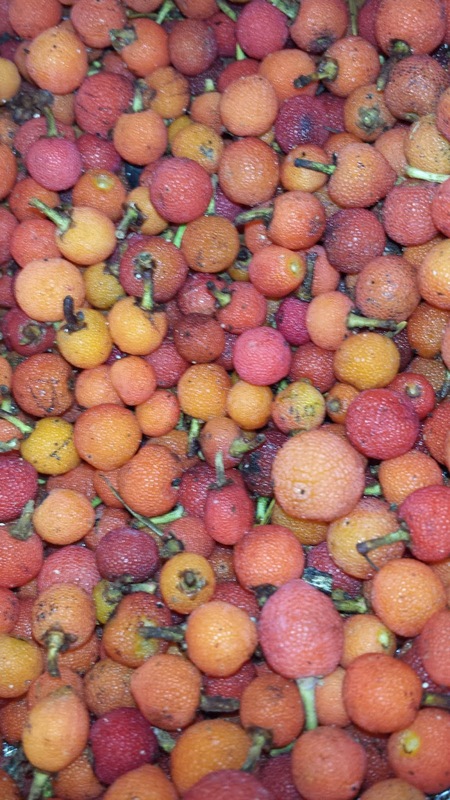 The berries are a quarter inch in diameter or smaller. The first time collecting berries, it is best to go along with someone local who has experience gathering these. Foraging is best learned as an in-person and in-the-field sort of affair. Once you have collected the berries, pick off stems, throw out the mushy or off-looking ones, and proceed to make jam or any number of things, or wash and just eat.